The Return of the Monster (Cookie)! As an adult, I bake some but I’d rather cook. Recently, however, I got a craving for my mom’s Monster Cookies…. chewy oatmeal peanut butter cookies loaded with chocolate chips and chocolate candy. Once in a great while I pull out the recipe and make a batch of those cookies…only, I usually only make a ONE-QUARTER-SIZE batch (both for sanity and consumption reasons). Sanity wasn’t with me this time, however. A monster cookie craving was! 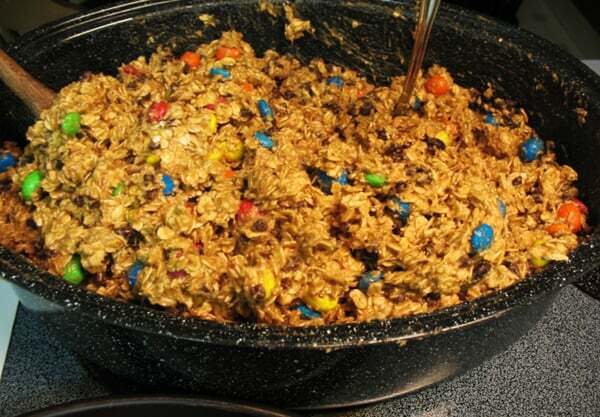 So, I pulled out the ingredients and thought, Heck, I haven’t made a WHOLE batch of Monster Cookies since I was a kid…why not…you know, for old times sake? Right off the bat, I realized I had a problem. My largest mixing bowl (which isn’t super small, I want to point out) wasn’t big enough for an entire batch of cookies. As a matter of fact, the ONLY thing remotely close to an appropriate size was my roasting pan. Even then, I had to split the dough in half and mix it in two batches before dumping it all together. Monster cookies stacked 1/2 dozen high...it makes a few cookies to be sure! Of course, all was not lost (as a matter of fact, the only thing lost was an evening)…it just took one bite of a warm, chewy cookie to remember why I wanted to make them to begin with. Mmmmm. I do love a good monster cookie from time to time. I’m pretty sure, though, I’m set for the rest of the year in the monster-cookie-craving-department. If I can find space in my freezer for them, that is. Drop onto ungreased cookie sheet by large mounded tablespoon. Bake in preheated oven at 350 degrees for 12-15 minutes. Let cool slightly so they don’t fall apart when you remove them from the cookie sheet (but don’t let them set too long or the candy will stick). Either way, you’re gonna have a stash of great tasting cookies. So call a friend and invite them over for coffee. Sit down, catch up and munch away!